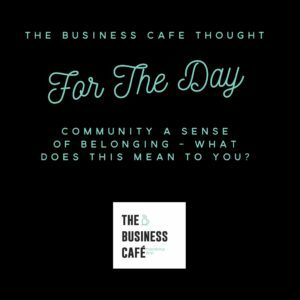 The Business Cafe has 3 key pillars that drive us. Community is the bedrock of all that we do. I guess you could call it the heartbeat of the business, the reason and the lifeblood. Working alone as many of us do, waking, working and then going back to bed, sometimes not seeing anyone else physically apart from our families (but that is not always the case) knowing that we have others wrapped around us that want us to be supported and successful can be a real comfort. We all have our reasons why we turn to the various communities, on and offline. It might be the different personality types, the different sharing of skills, the way we fit in. I always feel I can tell how I feel when I step into a community of people by the way my body feels. Relaxed or tight. This tells me whether I am on edge and want to be there or whether I fit and can be me. I have to belong to some that I don’t want to in order to learn, pushing myself to have skills I know I must have. Currently, I am in a WhatsApp Community that buzzes constantly, in order to learn about Blockchain Technology. My thoughts to day are around the massive growth in Community Building and Community participation, I would like to learn more about the motivations we have to be part of a community, or even start one. Plus, the skill to engage and become part of the community. I always liken online communities to the offline world of a Pub. You move into a village, you are a stranger, you walk in, people look at you, some say hi, some ignore you. You sit quietly, have a drink and walk out. The next time you walk in, you are recognised, they realise you plan to stay. Someone talks to you. You grow your confidence. Over time, you belong, you are no longer a stranger. The day you need help, someone is there for you. You now have friends. I can’t imagine my business life without my friends online. It is a key part of who I am now and how I function.